Before you get too excited when you check your feed stats, whether you are on a WordPress or a non-WordPress blog, including WordPress.com blogs, don’t get too excited. Reports are flooding the blogosphere as people check their feed stats and think “Wow! I’m suddenly popular.” Calm down. It’s not true. Feedburner’s has started reporting how many Google Reader and Google Personalized Homepage subscribers they have due to recent changes in Google Reader. Your stats are basically the same, but now some referrer links coming from Google Reader and Google Personalized Homepages are now being counted correctly as feeds. 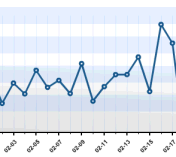 Here at ProBlogger I’d always seen the following graph in my feedburner stats (it shows the last 30 days activity in my feeds and where people came from). As you can see Bloglines made up 30% of my readership. Today however there’s a different story showing. With the Google figures now being reported we find that 39% of my subscribers are actually using Google Reader of Personalized Homepages and Bloglines only makes up 17%. In WordPress.com blog stats, Google Reader has not been reported through the feed stats but listed under referrers. In recent weeks, Google Reader has consistently been the top referrer to this blog. I thought it odd that Google Reader isn’t reported through the feed stats since it is a feed reader, and reported it to development. We’ll see if they switch that stat over to feeds. Either way, my feed stats have gone through the charts. Bloglines continues to lead as the most popular web-based reader, but this may change if the Google Reader stats are brought into the mix. So, don’t get too excited about these sudden spikes. They will even out over time, but let’s look at how this new information changes things. It’s also a note that we have to be cautious with all such data since it is easily changeable and not very accurate. Time will create more accurate statistical monitoring programs, but for now, we live with estimates. For more information on measuring your own blog statistics with WordPress, see Counting WordPress: Statistics WordPress Plugins. Note: I checked my blog stats earlier today and Google Reader was at the very top of the referrers list. I just checked now, after the date change, and the Referrers List reports Google at the top of today’s list so far, but “none” is listed for yesterday’s referrers. That’s odd. When I click on the link to see past Referrer statistics, yesterdays references are there. Must be a tiny glitch. This entry was written by Lorelle VanFossen and posted on February 17, 2007 at 8:15 pm and filed under WordPress, WordPress News, WordPressDotCom with tags wordpress, WordPress News, wordpress.com. Bookmark the permalink. Follow any comments here with the RSS feed for this post. Post a comment or leave a trackback: Trackback URL. The referral doesn’t differentiate between which feed, thus for instance if Darren links to one of your posts, you will get a spike in that number from his readers.